I could write about our wedding reception for days. It was by and large, so.stinking.fun. Seriously – from the time we entered to the time we all left, I had the best time. This is obviously going to be another picture heavy post so settle in and enjoy! 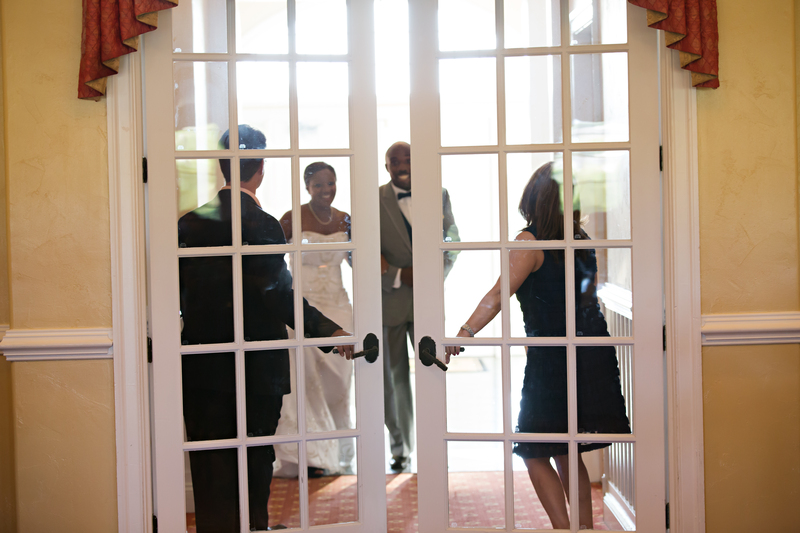 I love this picture of us about to enter the reception space. I love love love our venue. Our first dance was to John Legend’s “All of Me.” It was perfect and since it’s super popular, we hear it often. 🙂 We had our wedding party stand lining the back of the dance floor and I loved that. The Best Man’s speech. Heartfelt and funny. My sister totally cried through a lot of her speech which of course made me cry (see below – I wouldn’t post the picture of her crying – I love her too much :)). Ending on a happy note! Next week, I’ll share the party part – we really had SO much fun and the dance floor was packed ALL night! Our DJ was the best and I have had so many people tell us how much fun they had at the wedding — which makes me happy because we had a blast! What was the most fun wedding you’ve been to? Such lovely pictures! Your photographer really captured some touching moments. thank you! having 2 photographers really helped! Most fun wedding? MINE for sure 🙂 Pics are amazing, great photographer and some great moments! lol, i feel the same way! aww i just got tears at the picture of your sister giving her toast! i know, it makes me feel all emotional when i see it! Your pictures are amazing. You had such a fabulous photographer. Beautiful! I love that song, can listen to it all day. Your pictures are beautiful, and it looks like a really beautiful venue. Our son’s wedding was the most fun wedding I’ve ever attended. We danced the entire night! Our younger son’s best man speech was both hilarious, and so sweet! Congratulations. What a special day! Beautiful! Our first dance was a love song I listened to when I was a teenager. It starts in English and then German. The German singer is kind of the German Usher 🙂 It was so special and fit perfect to me and my husband.